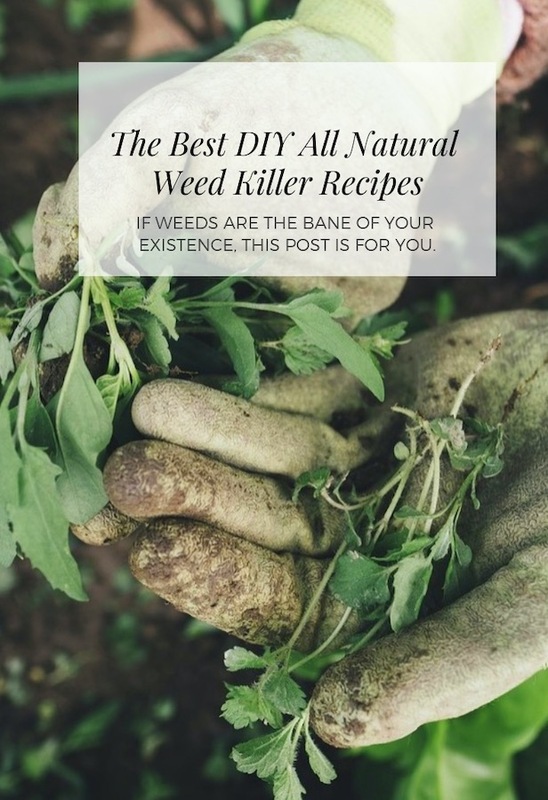 If Weeds are the bane of your existence, you will love our post that shows you a collection of ways that you can banish them from your yard naturally. Check out the ideas now. Imagine no more back-breaking weeding or nasty chemicals. 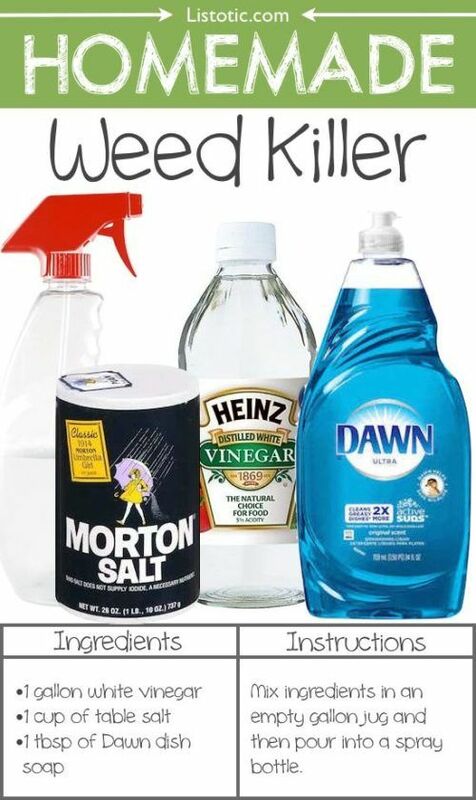 This collection of Natural Weed Killers are easy to make and work great! It’s important to remember that when you rid your garden of weeds, you are also killing natural microbes and fungi in the soil. This will inhibit the growth of vegetables and flowers, be sure to take this into consideration. 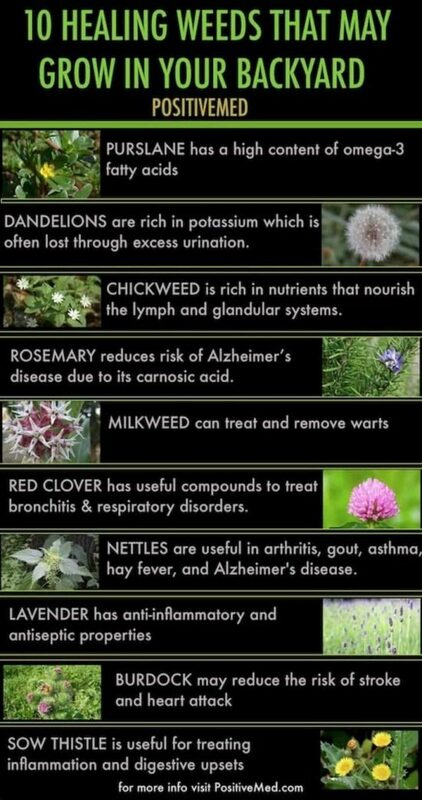 Before you embark on your own round of revenge in the garden, take a moment to check out this chart from Positive Med that lists 10 weeds that can be beneficial for you. It’s an impressive list especially when you see just what they can do for you. Dandelions are rich in potassium and milkweed can treat and remove warts. They are also excellent at attracting butterflies to your garden. 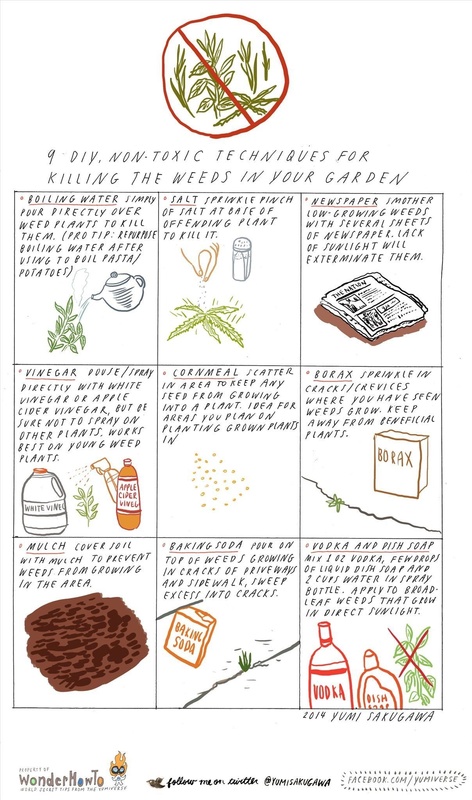 The above infographic from Wonder How To lists 9 Natural Homemade Weed Killers that you can road test. The least impactful is boiling water that can be poured directly over the weeds. Again, ensure you contain the area. You can also use Salt. Just sprinkle a pinch at the base of the plant and you will kill it. Newspaper is another effective material to use. Simply smother low growing weeds with several sheets. The lack of sunlight starves them until they die. Weed mat and mulch can work extremely well too. Vinegar is another popular alternative. All you need to do is douse/spray directly with white vinegar or apple cider vinegar. Be sure not to spray on other plants. It works best on young weeds. You can also use this recipe from Listotic which includes blue Dawn Dishwashing liquid. Cornmeal is another pantry staple that you can use. All you need to do is scatter in the affected area to keep any seed from growing into a plant. This works well for areas you plan on planting advanced plants in. 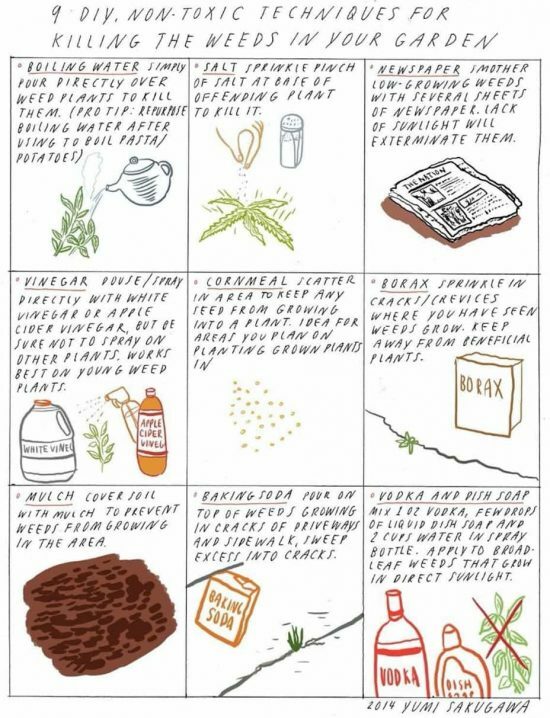 Borax has many uses too. The best way to treat weeds is to sprinkle in cracks/crevices where you have seen weeds growing. Ensure to keep away from your house and garden plants. 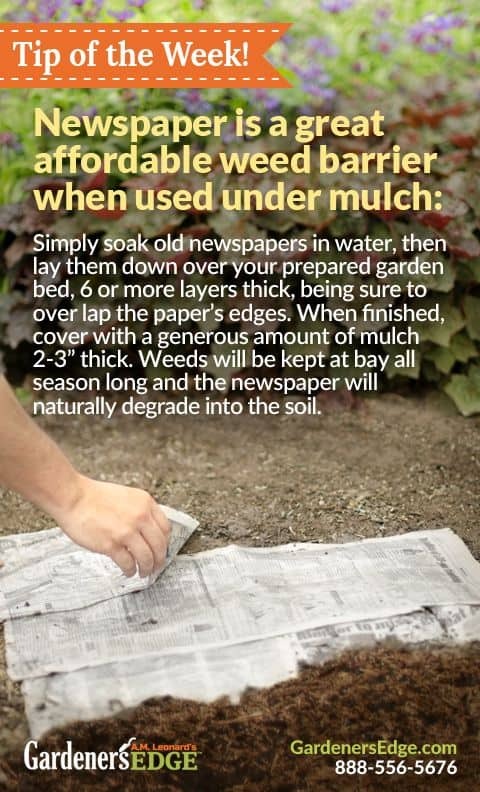 Mulch works a treat and all you need to do is cover soil with it to prevent weeds from growing in the area. It also makes it easier to pluck when they pop up. Fresh Eggs Daily also recommends the good old hand pull and chickens too. Apparently, they are wonderful weeders but be sure to keep them supervised! Baking Soda is another consideration. Pour on top of the weeds growing in cracks of driveway and pathways. Sweep excess into cracks. The video that we are including today shows you how to use Vinegar, Salt and Dish Soap.